Why do we need to monitor land use changes?? Monitoring land use changes are important to identify new buildings coming up, crop lands converting to plantations, water bodies getting dumped with land fills etc. Manually monitoring these changes is cumbersome and costly. We are trying to use machine learning and satellite data and check whether these changes can be identified. This blog is about our effort and some preliminary results. Who are the potential users?? Where do we get data for all this? NASA and ESA have launched satellites which help us to try out our algorithms. For works like this we use ESA’s Sentinel 2 satellite which is the best high resolution satellite data available in open domain. We created True color composites (TCC) for visual correlation. TCC is created by stacking blue,green and red images of Sentinel 2 satellite. As shown here the individual images are monochromatic and a combination gives us a color image.These images help in visually identifying the changes. In this case study we were looking at vegetation loss in an urban area. So we used a combination of vegetation indices over a period of time to detect the change. 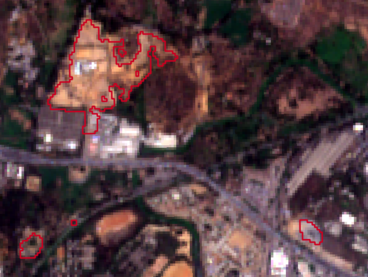 Our algorithm takes satellite images, removes cloud cover and then compares them over time. In the first step it identifies places where there is a permanent loss of vegetation by using unsupervised classification and thresholds. Our algorithm takes images every time its available in the data repository. 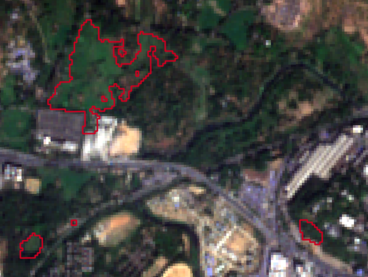 Sentinel 2 satellite gives data of a place every five days. In this case we have monitored changes every month or two. Once algorithm detects a change a predefined workflow triggers the end user for subsequent action.